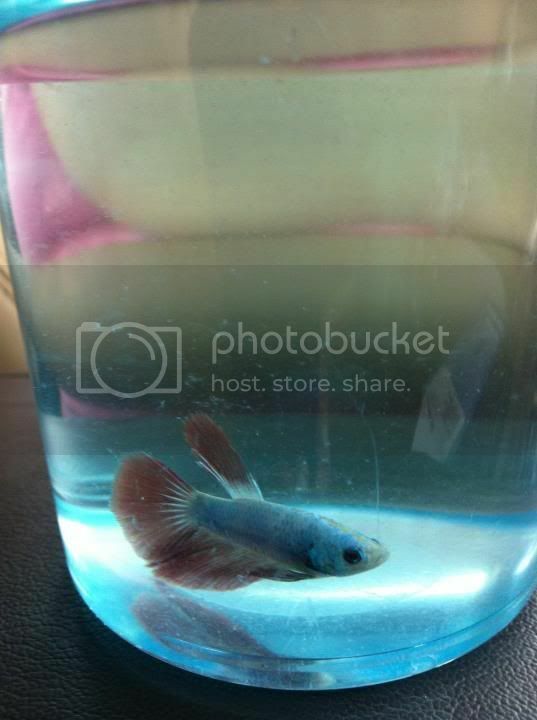 Paw Talk - Pet Forums > Other Pets > Aquatic Discussion > Betta- fin rot? This is Fernando. I bought him about a year ago at a Petsmart. He's a half moon betta, and has always been small. With the recent 'end of the school year' stress, I pushed off cleaning his home far too often than not, and resulted in him dulling in color, not eating, and laying at the bottom for the most part. Prior to about the last 7 days, I was getting a bit paranoid when I saw him floating near the bottom all the time, but his color was normal and he darted up to the surface whenever he saw my hand go for his food bag (flakes). On Tuesday I went out to restock on items, and bought some Aquarium Soulutions 'Betta Revive health aid'. I've heard mixed reviews on it. Some people I see say it's worthless and does nothing, while others say it has done miracles for them. I began treating him with the correct dose as instructed on the back of the package about 30 hours or so ago. He hasn't seem to have gotten any better, nor any worse. 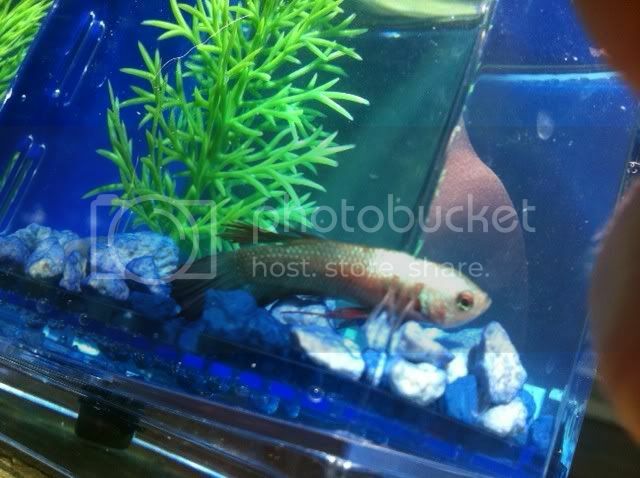 Through my observation after researching betta illnesses for hours the other day, I believe he has Fin Rot. Many say to simply really clean all of his things and have frequent water changes, but I'm worried that he'll starve himself to death before his fins heal enough for him! Is there anything I can do that will aid him in healing faster? I can't run out or order any special medicine for him beyond what I have. Though I'll make plenty of money over the summer, my parents are penny pinching at the moment and gave me a hard time over buying the medicine I did get 'over a cheap little fish'. What's his set-up like? Aquarium size, temperature, filtration, etc. I'm sure people on here can help but we definitely need more information . It does sound like he's suffering from ammonia poisoning so at the very least do a full water change and add a conditioner that binds ammonia (like Seachem's Prime) to give him some relief.